Road trips are an essential part of summer. Who doesn’t love getting their friends or family together and going on an adventure? However, if you're not careful it can quickly turn from a trip of a lifetime to a trip from hell. I’ve gathered my favorite travel apps for you to download that will ensure your trip is smooth sailing and stress free. 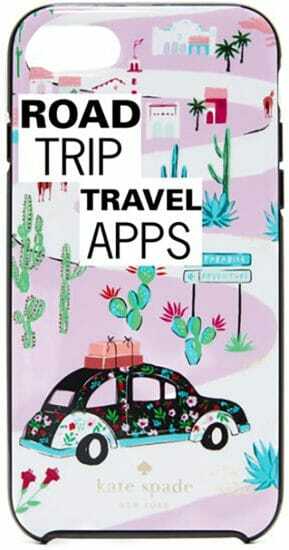 The apps listed below cover everything you’ll need from planning your trip, to how to find the best gas prices, to where to find the best scenic locations and everything in between. Now it’s time to pack up the car and let the journey begin! One of the most vital parts of planning any type of trip is making sure you don’t leave the important stuff at home. By using the Trip List App you can be sure that’s not going to happen. You can plan your itinerary, create detailed packing lists, sync with iCloud and then share with those that you’re traveling with. Think of Jetsetter as your own personal travel agent designed to give you incredible deals on five-star resorts and hotels. Enter in the dates that you’ll be traveling, the destination and then sort by property type, amenities and price range. Another benefit of this app is you can book directly through it. Who likes a collection of receipts sitting around, especially when you’re on the road. One of the many perks of this app is the ability to photograph your receipts and create expense reports. Some of the other features that are useful while traveling that this app gives you include keeping track of expense reports, hotel charges and hotel suggestions. With Wi-Fi Anywhere you’ll always know where there’s a hotspot that you can connect to. You can also manage and monitor your data usage and test which network speed is the fastest. Need to make a snack stop or use the restroom? iExit will tell you based on your current GPS location where the next exit is and it will also let you know the next 100 exits that are coming up so you can plan ahead. You can also search for hotels, gas stations and restaurants. Road Trip Lite is the fastest and simplest way to track your car’s mileage, maintenance expenses and fuel economy while on the road. This app gives you detailed graphs, lets you export the data to CSV and gives currency conversions when traveling over the border. Ever been on a toll road and you have to scramble for change? With The Toll Roads app, this will no longer be a problem. You can enroll in one-time-toll payments and create a FasTrak account to pay by your phone. Traveling to an area you’re unfamiliar with? GasBuddy will let you know where to find the most economical gas prices based on what other users are reporting. This app then points you in the right direction so you can find the type of gas you need and for the lowest price. When you’re looking for something a little more detailed than Google Maps, try the Scout App. It gives you turn-by-turn GPS voice navigation to your destination and you can set the app to avoid highways, tolls or carpool lanes. You can find the best route in real time traffic and share your ETA and plan a “meet up” with friends. You are also able to search for top points of interest and get the best traffic routes with real time traffic updates. With Scout you’ll be sure to arrive on time. Waze gives you the fastest route and it’s all for free. Automatically get rerouted to avoid police traps, accidents and traffic jams. Get police and speed camera alerts while you're driving. You can hear directions by celebrity voices or record your own. Locate the nearest gas station with the cheapest prices available. Choose to avoid toll roads and find the best parking spots. With Waze you’ll know how long your route is going to take you before you even hit the road. Discover cool places to see and plan your trip from there. This is the ideal road trip companion that will help you plan a cross-country trip or a weekend escape. Find quirky roadside attractions, local diners, national parks, hotels and scenic points. Your friends can also add suggestions to your travel itinerary. Ever watch the food network or travel channel and wish you could eat all the amazing dishes you see on your TV screen? Now you can. With 40 different TV shows and 5,000 restaurants you can dine like your favorite TV hosts. Search for restaurants in any location or use your GPS to find restaurants near you, and then create lists of places that you’d like to try. No matter what you’re craving or what new restaurants you’d like to experience, Yelp has it all. Find eateries based on your current GPS location, make reservations, pick up food or order delivery. You can read reviews by other Yelp users that will help you decide which restaurants to try and which to avoid. Then add your own thoughts and upload photos of the dishes you loved or the dishes you hated. Get amazing last minute hotel deals and book your reservation straight from your phone. This convenient app will also let your search for attractions and tell you what’s near you based on your GPS location. You can read other users reviews and see their photos so you’ll know that you’re choosing the perfect place to stay. Hotel Tonight also offers 24/7 customer support so everything goes as smooth as possible. Need a discounted hotel fast, or maybe you need to cancel your hotel reservation? Download Roomer. This app gives you last minute hotel deals at remarkably low prices (up to 80% off), from users that needed to cancel their trip. Another benefit of Roomer is if you’re stuck with a hotel reservation and it’s past the cancellation date you can sell it to the app. It’s a win-win for all. This free app lets you create professional looking photos with a huge range of editing tools at your fingertips. Think of it as an offshoot of Photoshop. Snapseed allows you to adjust exposure and color; apply special effects like vintage and grunge and then export JPG and RAW files. The app gives you photography tips and tricks and even offers some special features like ‘healing’ which lets you remove people and objects and ‘a glamor glow’ that lets you create professional looking fashion photos. Create awesome videos of your vacation in seconds, set them to music and then upload to your social media accounts. You can add up to 200 photos or video clips; choose from 26 different video styles and add fonts, filters and graphics. Once you’re done creating the magic, save the video to your photo library and upload to Instagram, Facebook and more. Here's a quick video I made to show you how it works. Always know what the weather is going to be like before you get there. Based on your GPS location you can get the nearest (and worldwide) weather forecasts. NOAA Weather Radar allows you to save your favorite locations, get hourly forecasts and receive hazardous weather alerts. Want to take some pictures of the sunrise or sunset? Check out the celestial information so you’ll know when it’s the best time to start snapping photos. When you need a break from listening to music check out Audible. Part of Amazon’s ever growing company this app lets you listen to audiobooks straight from your device and allows you to stream them in your car. There’s a huge selection to choose from. From best sellers to fantasy, romance to classics, horror to mystery, the topics are endless. Audible gives you chapter navigation, lets you download for offline listening and lets you send books from your library to your friends. Catch up with your favorite comedy, sports, news channels, talk radio and podcasts. Stitcher Radio lets you listen to stations like CNN, Fox, NPR and many more. Discover over 65,000 shows and stream or download episodes for offline listening. Create custom playlists and new episodes will be added once they become available. Stitcher is fast and pretty much glitch free, making it a perfect companion for when you’re on the road and don’t want to miss one of your favorite shows. For a fun way to pass the time try Road Trip Bingo. It comes with a variety of bingo games geared towards travelers. The goal of the game is similar to regular bingo but instead of marking off letters, you mark off icons like cars and trucks, cows and horses, detours and street signs and more. There are a ton of different bingo boards to choose from. It's a must have app when traveling with kids, but adults will enjoy it just as much. Everyone loves music, especially on the road. Blasting “Feel Fallin’” by Tom Petty while you’re driving down the coast is a must. Spotify lets you search for artists, albums and tracks--for free. You can create your own playlists, follow other users and download your music to play while offline. It’s a must for any music lover. Here’s A Girl in LA’s road trip playlist that you can listen to while cruising down PCH.